Day 2 - Click the pictures below to download the object set and 3x wall/floor sets (5 wall patterns each). Be sure to read the object descriptions below to see what they do! Chinese New Year tradition: The Chinese paste calligraphy of lucky sayings on doors and walls. Those with beautiful handwriting may make money by selling their calligraphy. >> Want to promote your calligraphy skills? 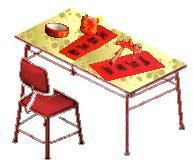 Get people to crowd around you at the New Year calligraphy station complete with pen, ink, red paper, desk, and chair. Cheers and boos not included. Friends will gather and admire your calligraphy. Chinese New Year tradition: The Chinese paste calligraphy of lucky characters on doors and walls. >> Don’t want to have to give that paper boy a red packet? Stop him from coming to your house with the no paper sign with the character “spring”! Will likely pay for itself after 10 springs. Chinese New Year tradition: The Chinese paste calligraphy of lucky poems on doors and walls. >> No money for museum-grade conversational art? For just 99 you can own factory-printed, industrial-grade calligraphy! But wait, there’s more! If you order now or sometime during your lifetime, you get 2 calligraphy prints! Yes, that’s 99 for TWO generic calligraphy printed on cheap red paper plus glue to paste them! Order now!